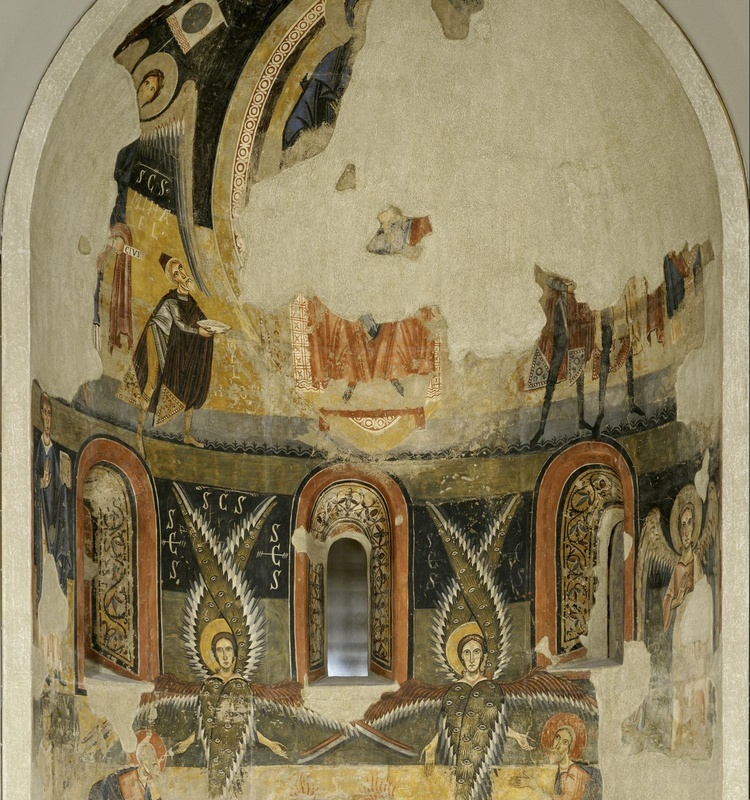 Situated in a visible way for the faithful, the altar frontals fulfil a notable pedagogical function throughout the history of liturgy and, in the way of a modern comic, they can reproduce different scenes that take place in different moments, showing the faithful a reality that different biblical episodes would also narrate. In the same way, the antiphons sung of the Divine Office function as short stories that, fragment by fragment, unravel an episode. In this case the scene of the Magi stands out, guided by the star that leads them to the birthplace to offer their gifts. In this antiphon, belonging to the eve of the Epiphany- first the scene is set and afterwards appears the dialogue of the characters who even describe the gifts, filled with the sound of the eight mode. 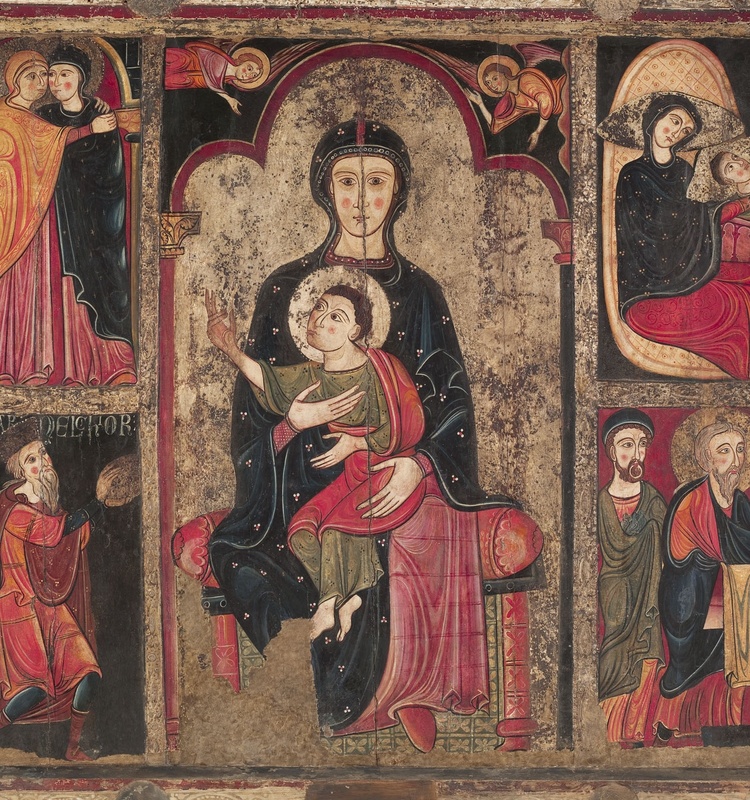 There are often small details within the scene of an altar frontal that are magnified by the repertoire of the Gregorian chant and collocated in a key moment for the meditation: the procession to receive the communion. After the killing of the innocent, a mother, Raquel, laments it. It is an anguished cry that is perfectly described with a simple word painting using semitone intervals for the wordsploratus et ululatus (crying and moaning) and in other moments of the piece. 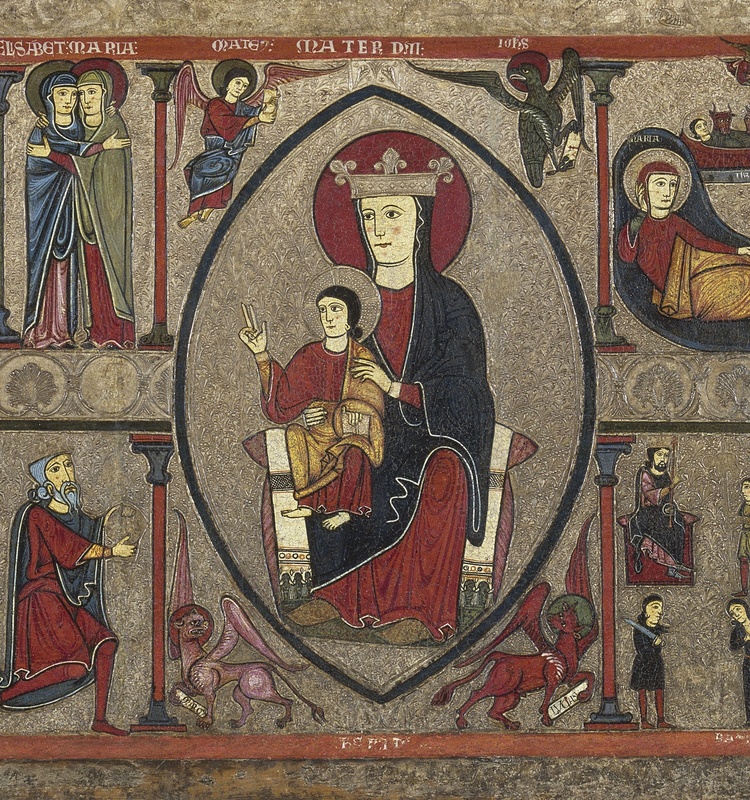 The scene is visible in the bottom right-hand part of the frontal at the same time as it shows the flight to Egypt. The choice of the seventh mode, the sharpest of the repertoire, is in connection with the cries and moans of a distraught mother. 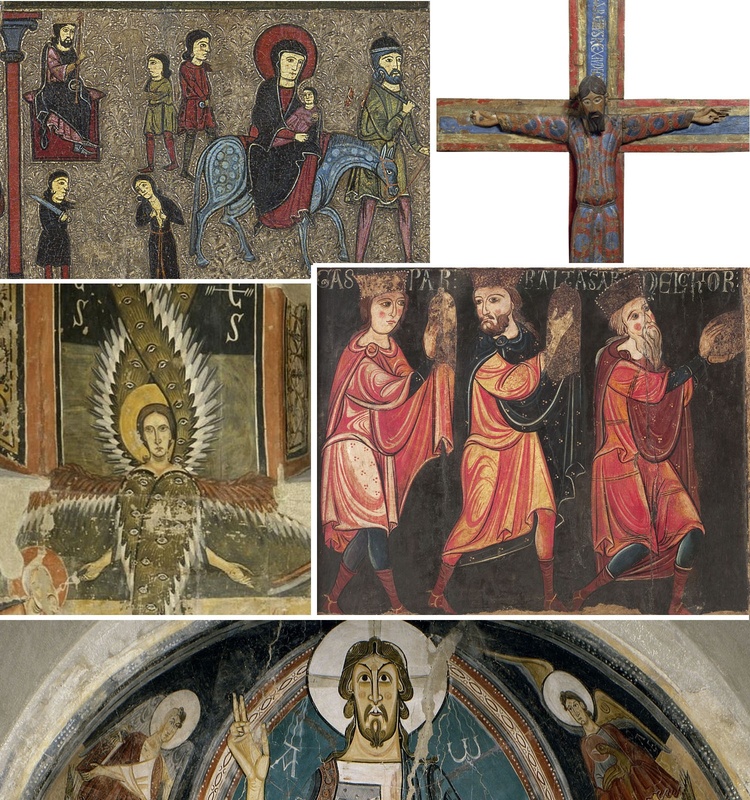 Christian iconography has had among its privileged images, the representation of Christ on the Cross. And the praise and worship are not limited to the figure of the crucifixion, but go further by focusing on the worship of the cross itself, vehicle of the martyrdom and subsequent resurrection. It is necessary to place it presiding the altars for the celebration, furthermore festivities emerged in which it was mainly worshipped on 3rd May or 14th September. But if there is one day dedicated to it, it is Good Friday. We have extracted this short piece from its liturgy which begins the ritual of the adoratio crucis. Gaul or Hispanic in origin, with great resemblance to the sound of theTe Deum, it is a simple piece in syllabic style which ends with an allusion to the sea and to the salvation that for him will be to all people. It is at the same time Christ crucified, but in majesty. As a reflection of earthly majesty, certain ceremonies would appear in which emperors and kings were present in a song of cheer that showed their power that emerged from the divinity. This is what we know as Laudes regiae orLaudes carolinae, due to the fact that it was spread precisely at the time of Charlemagne and, apparently they could be dedicated to him for the first time on the occasion of his imperial coronation at Christmas of the year 800. These are simple acclamations that show the greatness of Christ, his majesty, his kingdom and his empire, followed by a request in the form of a plea for the divinity to help and favour the sovereign, but always under the protection of the divine majesty. Simply done, all of them had an easy answer so that the people gathered could take part in collective singing. Surrounded by cherubim and seraphim, it can be sensed that this Maiestas Mariae, seated, firm and with winged creatures at his feet, singing a triple praise to the Father, Son and Holy Spirit:Sanctus, Sanctus, Sanctus...This same thing is proclaimed by the Te Deum, one of the few hymns in prose that has reached us, belonging to the repertoire of the Gaul, still with the text of the Greek NicetasRemesianus, from the 4th century. The regular interpretation of this hymn at the end of matins on feast days was one of the most popular and widespread pieces that later on would become part of the Gregorian repertoire. The image and music come together in this triple praise. 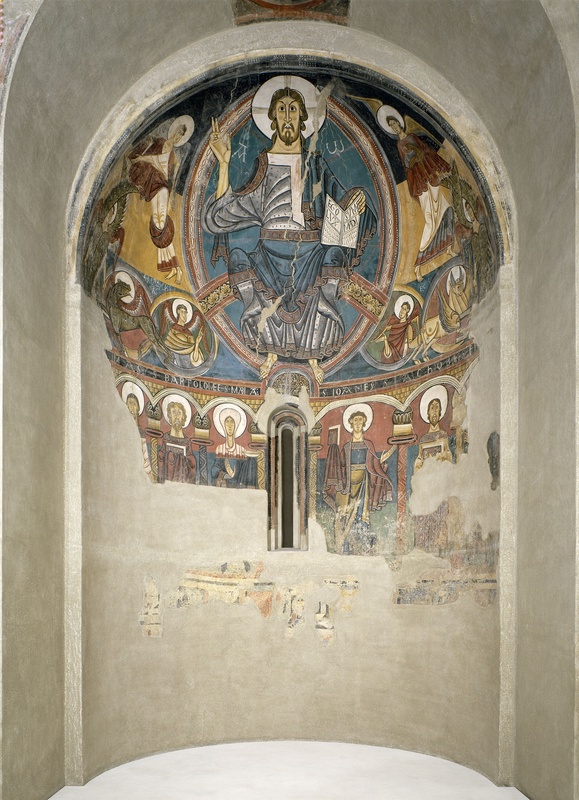 How are the images and music of the Romanesque related? The manuscripts of Gregorian songs and Visigoth songs allow us to put forward an answer: the contents painted on apses and the frontals of altarpieces, the carved figures on chests and capitals, and even the ritual formulas carved in commemorative inscriptions, have their sound equivalent in neumes that define the sensual spirit of the words. Because the societies of the Romanesque years were used to listening with the eyes, to look narratively at the messages of art. The melodic memory provided the limit to the plastic contemplation in a defined and sacred time. Currently, the dialogue between stone, wood, colour and voice allows the students of the subject of Plainchant or Plainsong to assimilate in context a performative situation that approaches medieval aesthetics. This itinerary invites the virtual spectators to share this experience.